Abstract: Images of sea urchin oocytes with hundreds of spermatozoa attached to their surface have fascinated scientists for over a century and led to the idea that oocytes have evolved mechanisms to allow the penetration of one spermatozoon while repelling supernumerary spermatozoa. Popular texts have extrapolated this concept, to the mammals and amphibians, and in many cases to include all the Phyla. Here, it is argued that laboratory experiments, using sea urchin oocytes deprived of their extracellular coats and inseminated at high densities, are artifactual and that the experiments leading to the idea of a fast block to polyspermy are flawed. 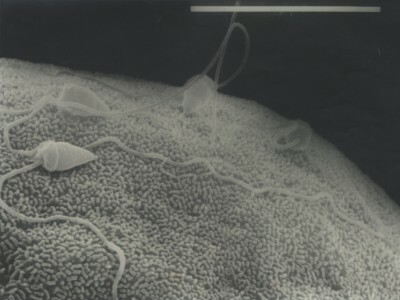 Under natural conditions, the number of spermatozoa at the site of fertilization is extremely low, compared with the numbers generated. The sperm:oocyte ratio is regulated first by dilution in externally fertilizing species and the female reproductive tract in those with internal fertilization, followed by a bottleneck created by the oocytes extracellular coats. In order to progress to the oocyte plasma membrane, the fertilizing spermatozoon must encounter and respond to a correct sequence of signals from the oocytes extracellular coats. Those that do not, are halted in their progression by defective signaling and fall to the wayside. Final success and entry is finely tuned by the spermatozoon anchoring to an actin-rich predetermined site on the plasma membrane. In this review, the variation in the form, function, and number of gametes produced across the animal kingdom and the many ways in which sperm–oocyte interactions are regulated to reduce numbers are discussed. Since in nature, final sperm:oocyte ratios approach unity it would appear that selective pressures have favored the achievement of monospermy, rather than the evolution of polyspermy preventing mechanisms.